Will Kreamer has been involved in athletics for the last 49 years. An all-state guard, he played on Ollie Mayfield’s 1970 Tucson High School state championship football team. Kreamer played center for the Arizona Western College’s 1972 national champions. Finishing his degree in history at the University of Arizona, Kreamer began his 40 year teaching and coaching career in 1976. He was the first girls basketball coach ever at Tucson High School and was named Coach of the Year in 1978. As a first year head football coach Kreamer took Santa Rita High School to its first playoff appearance in its history in 1983 and at Sahuaro he won the division each year from 1995-98. As head football coach at Tucson High School Kreamer took over and 0-10 team from the previous year and had a winning season in 1999. He was named Coach of the Year twice for football in 1983 and 1998. He also coached for 3 years at Pima College and professional football in Italy for 3 years. 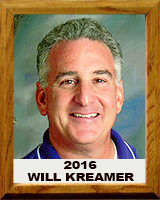 Kreamer became an Assistant Principal in 2002 and worked at Sabino, Tucson High School and Ironwood Ridge High Schools. IRHS received the Earl McCullar award for excellence in athletics in southern Arizona under his leadership. He was a 4a and 5a board member to the AIA during this time. Kreamer was recognized and inducted into the Tucson High Alumni T-Club’s Hall of Fame as both a player and a coach in 2002 as well as the Arizona Western College Hall of Fame in 2012. He was named a “Signature Coach” for the Coaches for Charity Kickoff Classic in 2013 and received the Kino, Sonoran and Southern Region Service Award in 2015.